If the rotating field of a large synchronous motor with salient poles is de-energized, it will still develop 10 or 15% of synchronous torque. This is due to variable reluctance throughout a rotor revolution. There is no practical application for a large synchronous reluctance motor. However, it is practical in small sizes. If slots are cut into the conductorless rotor of an induction motor, corresponding to the stator slots, a synchronous reluctance motor results. It starts like an induction motor but runs with a small amount of synchronous torque. The synchronous torque is due to changes in reluctance of the magnetic path from the stator through the rotor as the slots align. This motor is an inexpensive means of developing a moderate synchronous torque. Low power factor, low pull-out torque, and low efficiency are characteristics of the direct power line driven variable reluctance motor. Such was the status of the variable reluctance motor for a century before the development of semiconductor power control. If an iron rotor with poles, but without any conductors, is fitted to a multi-phase stator, a switched reluctance motor, capable of synchronizing with the stator field results. When a stator coil pole pair is energized, the rotor will move to the lowest magnetic reluctance path. (Figure below) A switched reluctance motor is also known as a variable reluctance motor. The reluctance of the rotor to stator flux path varies with the position of the rotor. 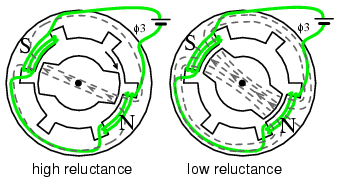 Reluctance is a function of rotor position in a variable reluctance motor. Sequential switching (Figure below) of the stator phases moves the rotor from one position to the next. The mangetic flux seeks the path of least reluctance, the magnetic analog of electric resistance. This is an over simplified rotor and waveforms to illustrate operation. Variable reluctance motor, over-simplified operation. If one end of each 3-phase winding of the switched reluctance motor is brought out via a common lead wire, we can explain operation as if it were a stepper motor. (Figure above) The other coil connections are successively pulled to ground, one at a time, in a wave drive pattern. This attracts the rotor to the clockwise rotating magnetic field in 60o increments. Various waveforms may drive variable reluctance motors. (Figure below) Wave drive (a) is simple, requiring only a single ended unipolar switch. That is, one which only switches in one direction. More torque is provided by the bipolar drive (b), but requires a bipolar switch. The power driver must pull alternately high and low. Waveforms (a & b) are applicable to the stepper motor version of the variable reluctance motor. For smooth vibration free operation the 6-step approximation of a sine wave (c) is desirable and easy to generate. Sine wave drive (d) may be generated by a pulse width modulator (PWM), or drawn from the power line. Variable reluctance motor drive waveforms: (a) unipolar wave drive, (b) bipolar full step (c) sinewave (d) bipolar 6-step. Doubling the number of stator poles decreases the rotating speed and increases torque. This might eliminate a gear reduction drive. A variable reluctance motor intended to move in discrete steps, stop, and start is a variable reluctance stepper motor, covered in another section. If smooth rotation is the goal, there is an electronic driven version of the switched reluctance motor. Variable reluctance motors or steppers actually use rotors like those in Figure below. Variable reluctance motors are poor performers when direct power line driven. However, microprocessors and solid state power drive makes this motor an economical high performance solution in some high volume applications. Though difficult to control, this motor is easy to spin. Sequential switching of the field coils creates a rotating magnetic field which drags the irregularly shaped rotor around with it as it seeks out the lowest magnetic reluctance path. The relationship between torque and stator current is highly nonlinear– difficult to control. Electronic driven variable reluctance motor. An electronic driven variable reluctance motor (Figure below) resembles a brushless DC motor without a permanent magnet rotor. This makes the motor simple and inexpensive. However, this is offset by the cost of the electronic control, which is not nearly as simple as that for a brushless DC motor. This is the opposite of the high ripple torque desired in stepper motors. Rather than a stepper, a variable reluctance motor is optimized for continuous high speed rotation with minimum ripple torque. It is necessary to measure the rotor position with a rotary position sensor like an optical or magnetic encoder, or derive this from monitoring the stator back EMF. A microprocessor performs complex calculations for switching the windings at the proper time with solid state devices. This must be done precisely to minimize audible noise and ripple torque. For lowest ripple torque, winding current must be monitored and controlled. The strict drive requirements make this motor only practical for high volume applications like energy efficient vacuum cleaner motors, fan motors, or pump motors. One such vacuum cleaner uses a compact high efficiency electronic driven 100,000 rpm fan motor. The simplicity of the motor compensates for the drive electronics cost. No brushes, no commutator, no rotor windings, no permanent magnets, simplifies motor manufacture. The efficiency of this electronic driven motor can be high. But, it requires considerable optimization, using specialized design techniques, which is only justified for large manufacturing volumes. Simple construction- no brushes, commutator, or permanent magnets, no Cu or Al in the rotor. High efficiency and reliability compared to conventional AC or DC motors. Cost effective compared to bushless DC motor in high volumes. Adaptable to very high ambient temperature. Low cost accurate speed control possible if volume is high enough.